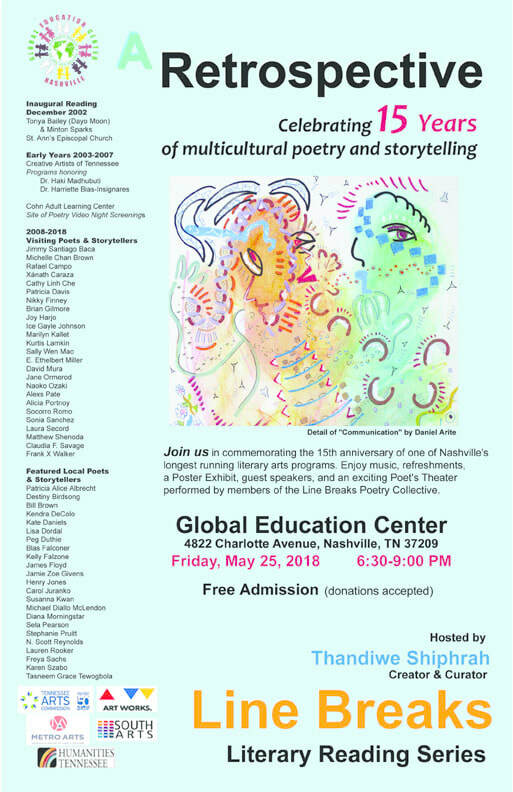 Join Global Education Center as we present Line Breaks Literary Reading Series Retrospective: A Celebration of 15 years on Friday, May 25, 2018 with 6:30 pm reception and 7:30 pm program. ​This event will be a celebration of the Line Breaks Literary Reading Series more than 15 years in the Nashville community. We will enjoy performances from several members of the Line Breaks Poetry Collective including Kana Gaines, Diana Morningstar and many more. There will also be a poster exhibit showcasing the poets and storytellers - local, regional, national and international - who have been a part of this unique program.